Your cooker is the centrepiece of your kitchen and your home. Go for an oven model and design that will complement your house, but don’t forget that you’ll also want one that’s easy to use. You don’t want an annoying oven door or poorly fitted hobs to get in the way of you cooking and having fun in the kitchen. Whether you decide to go for a gas cooker, an expensive range cooker, or a budget electric one– read our expert reviews for all the top features and oven brands you should be looking out for. Electric models tend to be some of the cheapest appliances around and they offer a simple and streamlined cooking experience. Easy to use and safe to run, electric models compromise of a range of different oven and hob technologies and designs. You can often get three forms of electric hob with these cookers. Solid plate tops are still commonly found on the budget models, and while they are the least energy efficient and take the longest time to heat, they are still reliable options. Ceramic hobs are popular because they are easy to clean and control and they look streamlined. By heating up the ceramic glass surface efficiently, ceramic hobs tend not to waste energy. Taking ceramic hob technology to the next level are induction hobs that only heat up the pans surface thanks to their magnetic technology. Pricier than other hobs, induction hobs are taking the kitchen appliance world by storm thanks to their precision. A single oven with an integrated grill, which is perfect if you need something plain and simple but which offers reliable results. The oven is conventional, where heat rises from the bottom, ensuring evenly cooked food. It is particularly great at pizzas, meat and cakes, where you need crisp outers but moist inside. There is also the grill, which opens up the possibilities a little – everyone loves a bit of cheese on toast to tide them over before dinner. All of the heat stays firmly within the cooking chamber thanks to the double glazed window on the door. This also allows you to watch the progress without opening the door periodically, which we all know results in a drop in temperature, longer cooking times and a faceful of steam. It is rated A for energy, so won’t make a painful impact on your bills or the planet. Access to the oven is from a door which pulls down, which will appeal to anyone who doesn’t like side doors for space or difficulty. As there is only one chamber for both the grill and oven, it may not be the best for large families or households where a few foods need to be on the go at the same time. It also doesn’t come with the power lead, which is a little strange but can easily be remedied with the help of a professional installation. All in all, it is a good price for an item which offers a lot of opportunities and for anyone who wants something which purely does the job. A freestanding oven for all of you out there who find that getting an appliance which can handle your baking is essential. There is a generous amount of settings and functions included, such as the PlusSteam moist fan baking function which can ensure your cakes, bread and muffins all come out of the oven wonderfully soft and just as they should be. It adds the right amount of steam to the chamber before you pop in the goods, so the outer is crisp too. The main oven is fan controlled and the second is conventional, so whatever your desired results there is a chamber which can help you out. Both have a very good capacity too, so if one of your main concerns is space as you love to make big meals, you’re covered. You get two shelves included, and there are five positionings in the main oven, so plenty of scope to expand on this. A minute reminder will let you relax while the oven is at work, ticking down until it is all ready. Catalytic liners make cleaning the oven a lot easier as nothing should stick or burn on; just give it a wipe occasionally. They absorb the grease and splashes, destroying them, so you don’t have to. For safety, there is a hot hob indicator, so you know not to touch anything with residual heat. These zones are ceramic, so heat much faster than your traditional electric solid hotplates. We think it is a good price for an appliance which has so many features, is so generous in capacity and room, and is overall very reliable and well-built. Not just one for the Mary Berry wannabes, either. Thanks to the two ovens and integrated upper grill, there is plenty of scope to get your meal components cooked at the same time without having to cram it all in. Plus, it’ll be evenly cooked as well which is down to the fan distributing heat across all levels equally. The main oven is quite a generous capacity, so it should be easy to accommodate anything from a huge casserole to the Christmas Day turkey. To match, there is also a large baking tray included so you won’t struggle to find one which is the perfect fit. In fact, it is 25% larger than your standard ones you’d be able to find elsewhere. With a triple-glazed window, you’ll be able to view your food as it cooks without continually opening the door and letting the heat escape. No more burnt chips or facefuls of steam. The control knobs feel a bit plastic-y, but they turn well and smoothly for good control. The overall design is very pleasing and modern, perfect for any kitchen layout or design. Double oven cookers are a great addition to any household which is always struggling for oven space, and this particular model has plenty of room for the largest of meals, cooked to perfection. The price is justified. One of the more cheap and cheerful cookers we have reviewed that are available, but that isn’t to say it is any less impressive. This Swan number really is a budget must-have. We love how it fits the classic silhouette and doesn’t mess about with any unnecessary extra features which can be a fiddle to work. There are four hobs, two of which are rapid heat zones so you don’t have to wait around for them to heat just to boil some pasta. One chamber accommodates both the 60L capacity oven and high-performance grill, so while you can’t use both at the same time, they are still fabulous standalone additions. Enamel interior means it is easy to clean, and the glass door pane is removable when that needs a wipe too. As it is clear glass, you can easily check on the progress of your meal. You get height adjustable feet so it will blend in with your worktops or sit on uneven surfaces, and 3 wire shelves and a grill pan set are included. Overall, it is straightforward and no fuss. Good if you’re on a budget or want to avoid all the talk of smart ovens/a million features/touch screen operation etc etc. A fantastic all-rounder, this is cheap and cheerful design at its best. 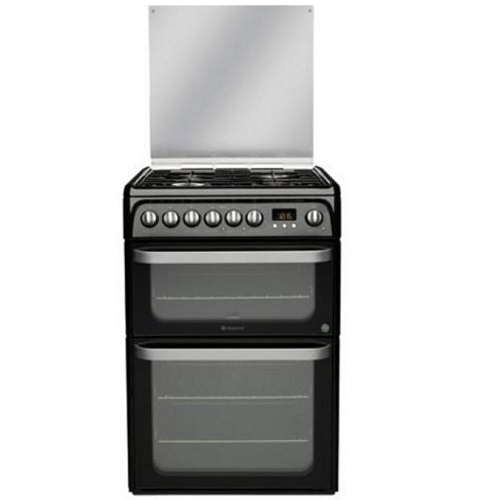 Beko have given us a great quality electric double cooker for people who don’t care about flashy design. This oven and hob combo might not be the nicest to look at, but it does what it should. With a good energy efficiency rating and a nice ceramic hob, you can’t go far wrong for this price. Inside the top oven, you will find a full-width grill. You can use this at the same time as using the bottom oven if you have a full meal on the go. Everything is controlled by touch buttons, and the display makes it simple to see how long you have left, and what time it is set to. As the main oven is fan assisted, heat is evenly distributed. There is a 69L capacity and two wire shelves, so everything will fit nicely. Cleaning is easy thanks to the internal enamel coating so an occasional wipe will suffice. It may not be the prettiest, but the white/black and stainless steel combination still makes it an attractive fit for any kitchen decor. The design is on the basic side for the price, but the functionality makes up for this and we love the flat ceramic hob which makes cleaning a doddle and spills simple to clear. This is a great kitchen appliance for those looking for a kitchen steal. With this model, you get the latest ceramic induction hob technology as well as two ovens for a decent price. Induction hobs are great because they only heat up the surface of the pan, wasting zero energy and ensuring an even cooking experience. We love the touch controls, and good-sized LED screen. This model also comes in some attractive shades if you wanted to mix things up a bit. Why not choose metallic red for a standout? Cleaning is easy thanks to the non-stick enamel interior. Pre-heating is also no effort as the fan gets things going smoothly and quickly. Getting used to the controls is what we found will take the most time, as they’re not the clearest at first glance, but you should handle it after a few goes. This is a great kitchen appliance buy for those looking for induction hob technology – try it out for yourself and see what you think of this latest kitchen trend! Gas appliances are loved by some, hated by others. Gas ovens can sometimes heat up unevenly, but gas hobs hold a certain allure. Gas is seen as a more authentic way of cooking because you can actually see the naked flame, and it’s also still the cheapest fuel. An attractive silver gas model from Hotpoint, this is perfect for anyone who loves the power and ease of gas but finds safety is a key concern. This stainless steel all-in-one offers a compact alternative to more expensive gas range cookers. Cooking with gas is extremely rewarding thanks to the easy temperature control and fine tuning ability. With the HUG61X, ignition is done with just one hand, by turning and pushing the control knob. Great if you’re stirring something else with the other hand. This also increases safety because it can’t be knocked on accidentally. The oven has a timer, which not only offers perfect results and precision but also turns it off when done. We have all left the oven on after using it and only realised when we are doing the washing up. Those will be days of the past. It still has all the basics though – catalytic cleaners break down any fat and grease which has been burnt on. Just wipe it afterwards once it is cool. A capacity of 109L in total will keep even the biggest of families in check, and the variable grill can be set to full or half width. Plus there is high energy ratings. Essentially, you’ll never use more energy than you need to and it is very purse-friendly to run. A good solid appliance that will fit in with any kitchen design. There are plenty of features to keep you going, and it makes safety a priority which is pretty priceless. This is a super simple gas oven and hob that will help you get set up for the first time in your kitchen. Or maybe you want to roll back to basics and settle for a cooker which can do the job without any fancy additions. Nothing quite beats the feeling of cooking with gas, for the sheer power you get. There is a 4 burner gas hob, and a heat deflector will protect the dials from heat damage when it is opened. It is slim at only 50cm width, so ideal if your kitchen can’t accommodate huge appliances. There is only one shelf included unfortunately, and the all-white design will put some people off as it doesn’t look very modern. It is lightweight and there is therefore a bit of a tinny feel to it, but for the price, it is easy to get past after a few uses. We have to say we loved the extra storage at the bottom though – if every cooker had this life would be easier! Cheap and cheerful, does what it says on the tin. A great budget buy. Dual fuel cookers give you the perfect balance between the best cooking fuel for the job. They are often electric cooking chambers, with a gas hob, which is widely seen as the best of both worlds. Offering versatility and the best options for every cooking eventuality, this Hotpoint dual fuel model is great for any households which cook a range of dishes. The main electric fan oven is great for those larger meals, as it allows the heat to circulate better and results in more thorough cooking. Just what you need if you always find your lasagne to be far too crispy on the top but not done enough in the middle. It also makes it great if you want to cook two dishes at once as the flavours won’t transfer, so your homemade apple pie won’t have a roast beef joint taste to it. Conventional cooking is great for those quicker cooks, and this can be found in the second smaller chamber. There is also a full-width Solarplus grill. If you’re wondering what that is, simply put it means that it is a little quicker and more energy efficient than your standard grill. Catalytic liners are in place to reduce the amount you have to scrub the oven every month – a wipe down when cool should do the trick. It is fast to warm up, and the cast iron hob supports are sturdy and give a safe base to all your pots and pans. We love the style, which has hints of a range cooker design, and the fact we can’t find a bad word to say basically says it all! If you’re after a freestanding, dual fuel cooker around 60cm in width to fit your kitchen, then this Hotpoint Ultima should be a big consideration. A roomy 65L oven chamber should be big enough to accommodate your bakes, cakes and roasts, and a separate grill compartment means you can use both at the same time. The four burner gas hob comes equipped with a glass lid for when it isn’t in use, which can also act as a splashback when it is up against a wall. Moving pans around on the hob means the stands can get a bit wobbly as there are four as opposed to two large ones, so be careful. The knobs were a bit different in the fact that their function was written underneath, rather than some form of image or drawing. It would be better if it were above each dial for easier viewing. For the grill, getting the hang of which way round you turn for full and half grill is a bit confusing. They’re also set a bit of an odd way round, not the most intuitive layout so that all takes a little while to get the hang of. But once that part is done, actually turning them is fine and easy. Despite its downsides, the heat is very generous, and it seems to cook the food well. They are all things you can adapt to, rather than issues which take away the enjoyment of the cooking. Thousands of people have bought it and given it 5* reviews so it is a popular model and will look great in any kitchen. Having the safety and ease of an electric oven along with the instant heat and exceeded control of a gas hob is the preferred choice of a lot of kitchen users up and down the country. This single model from Indesit is just that, with four burners and a large capacity cooking chamber. Ignition is automatic to make life a bit easier, and the dials are all very simple to control and understand; one for each burner, one for the temperature, one for oven setting and one for a timer. Regarding safety, you need to press the pilot light for the ignition to work, so there is no turning it on accidentally. Fail-safe will also ensure it is not on when it shouldn’t be. We liked the little storage drawer at the bottom of the oven, which comes in handy for keeping any pans or baking trays at easy reach, saving you some space elsewhere. It is worth us mentioning that it isn’t a drawer though, just a pull-down flap, so it can be a bit difficult getting things out. It isn’t a fan oven, so it takes a bit longer to heat up, and the markers on the control dials are a bit fine so not that easy to read and see. 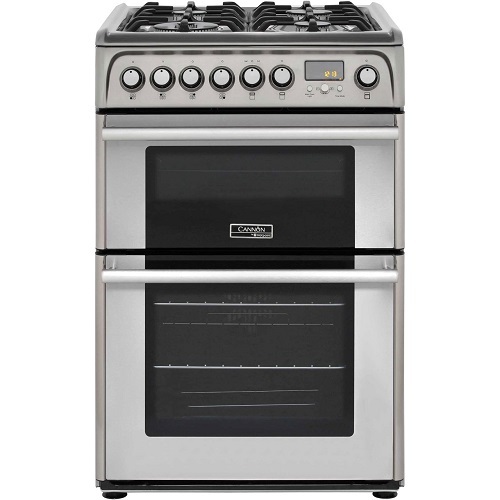 But other than this, for the price, it is a great little oven. The manufacturers guarantee is also fab for no extra cost. A dual fuel model that offers you the best of both worlds, this Indesit offers great control and brilliant accuracy. There are four burners to give you plenty of space when boiling your veg, and the two pan supports fit really nicely to make using the pans comfortable and not risk any movement. Monitoring your food in the oven is made easy with the glass door pane and interior light. It is a 58L capacity too, which will suit small families or singles perfectly. There is also a minute minder which will tick down and let you know when time is up. No more burnt chips. Need to grill instead? It is full width, so everything will be done in one batch. A grill pan is included so you don’t have to search high and low to find the perfect fit. The overall energy efficiency is B, which is low compared to the commonly found A/A or A+ ratings of other modern picks. But at the end of the day it won’t add a noticeable amount to your bills and running costs. It is cheap and easy to control. It is easy to keep clean and the stainless steel will fit into any kitchen. Overall, it isn’t the standout in every category but the sheer amount of functions and quality control certainly makes it a worth addition to our review list. Less energy-efficient than other models we’ve featured, but this is still a great dual fuel from Indesit for those who don’t need a lot of cooking space on a daily basis. Easy to use and easy on the eye, this offering from John Lewis shows off their usual quality and precision to a tee. For anyone who loves gas hobs but likes some flexibility with their oven, it is a steal. John Lewis appliances are famed for their quality and this appliance is no different. This oven has really been designed with usability and functionality in mind, and it’s a great dual model that will last and last. There are generous oven windows so you can keep an eye on that souffle, and the handles are easy to grip and manoeuvre. If control dials are usually problematic for you to see as you need to bend down, then the fact these ones face upwards will appeal. Control at a glance – perfect. 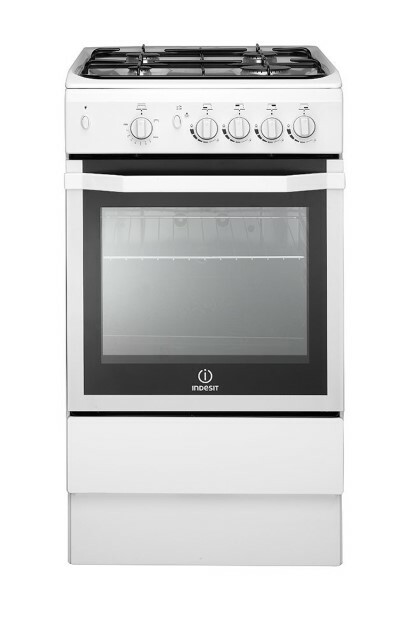 Capacity-wise, the fan assisted main oven is 79L which is plenty for those large family meals or Sunday dinners. The 34L second oven gives you overflow if you ever need it, or allows you to split the meal if you don’t want any transfer of odours. Or, if the rest of the household are out and you want to be economical when cooking for yourself, there is ample space for a smaller meal. There’s lots of things you’d rather be doing than cleaning an oven. Thankfully, catalytic liners which disperse grease and a removable glass door pane keep things nice and simple when the time inevitably comes. Another great quality appliance from John Lewis, which allows you to get the best of both worlds without paying a premium. Your stove is the heart of your home. Whether you want an expensive Aga, or are happy with a budget electric option, choosing your oven and hobs is going to be one of your most important home appliance buys. Cookers generally comprise of an oven (or two), with hobs on top for fast cooking. They can be powered by gas or electric, but they can also be dual fuel (a combination of gas hobs with an electric, fan or multifunction oven). Cookers come with a range of hob technologies, from high-tech induction to traditional gas. When you are buying an appliance, make sure you invest in a quality appliance that won’t guzzle energy. It’s a good idea to read reviews and see what other people really thought, as there may be hidden usability issues caused by an awkward design (hot oven doors, awkward hob controls etc). Security features like automatic pan recognition and child locks are also well worth investing in. These days you can also get stylish built-in ovens that sit within kitchen units, fuelling the need for people to buy separate hobs. Dividing the traditional appliance in two gives people a more flexible kitchen design, but all-in-one options are still probably more cost-effective and remain popular. What Is The Difference Between A Cooker And An Oven? An oven refers to the cooking chamber part of the appliance – a cooker is made up of of both an oven and the hobs on top. It is a larger unit than an oven. What Makes For A Good Cooker? Make sure that you always measure your cavity correctly. Most single cookers are 60 cm high, whereas double model tend to come up to 90 cm. Decide on which fuel you want and stick to your guns – don’t get sucked in by sales copy if the appliance isn’t right for you. Think about how you and your family are going to use the kitchen. A good design is great, but make sure this is a model you will be proud to look at for a long time – it is a long-term investment, not an impulse-buy. Look out for top brands like Hotpoint, Indesit, Beko, Rangemaster, Smeg, Zanussi and Bosch. Make sure you get a good guarantee period and a good installation deal. Make sure that you have your new appliance installed by a proper qualified engineer. Undertake regular in-depth cleaning of oven cavities with suitable oven cleaning materials to combat against ingrained dirt. You have to carry out routine hob cleaning & maintenance to keep your hobs looking good. Did you like any of these cookers? What about going for a built-in oven and hob solution for your kitchen? Read our built-in oven reviews and hob reviews to find out more.